There is a common perception that when a natural disaster struck in the Middle Ages, the people would just say that this was God’s punishment for their sins. However, this was not always the case – at least when it came to flooding in Valencia. This was the topic of a paper given last month by Abigail Agresta at the annual conference of the Renaissance Society of America. Her paper – “That For Which the King of Kings Sent the Flood”? Flood Prevention in Medieval Valencia – examines the Spanish city’s records when they were struck by flooding. Valencia’s climate gets very little rain, but torrential downpours can occur, especially in the autumn. Moreover, Valencia and its surrounding area had a network of canals to irrigate fields, which also fed into a moat that protected the city. This led to several floods that are noted in city records during the fourteenth and fifteenth-century. When these floods did occur, Agresta notes that city authorities did not see these disasters as a punishment from God. Instead they blamed their own residents, noting that their habits of throwing trash and refuse into the canals would lead to blockages of the waterways, leaving the city “exposed to peril and destruction.” A Valencian record from 1328, for example, notes that such flooding has caused the streets to be choked with debris, and orders every person to spend the next two days to clean the city. Agresta finds that city authorities focused on keeping their waterways well-maintained, and they also on occasion had new channels created to redirect water to other areas around Valencia. Until the mid-fifteenth-century, their actions on flood protection show that they saw it as a man-made problem. At this point, though, their responses begin to change, and start to see a more religious element introduced. This is first seen in 1424, when the city council writes a letter to a nearby monastery, asking them to pray for more serene weather as they deal with flooding. Then in 1453, when another flood hits the city, authorities react by ordering a religious procession take place. This changing responses may have been at least partly due to a more religious turn that can be seen in fifteenth-century Europe. 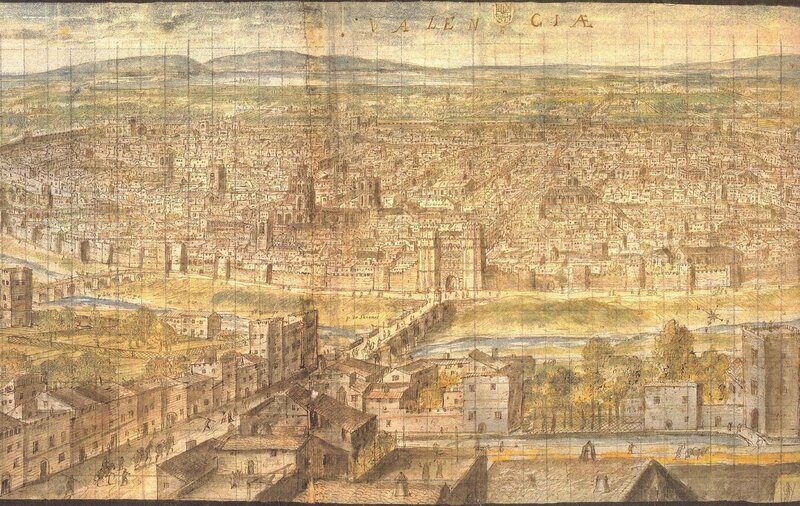 Top Image: View of Valencia in 1563, made by Anton van der Wyngaerde.